I wonder if Dimitry Davidoff knew what would happen when he came up with a game he called Mafia back in 1986 or maybe 1987 as a tool of psychology research. Mafia was the first of many hidden identity party games following the same pattern: a minority of players that know who their partners are against a majority of people that are kept in the dark. The most well-known offspring of the genre is almost certainly Werewolf with its countless variants and hundreds of additional roles. You know what? I’ll just assume you’re familiar with Werewolf. Now that we established everyone here knows the Werewolf type of game, we might be able to agree on two small problems with the concept: you need a game master and you’re eliminating players from the first round on. Needing a game master is not always a problem, there is many who enjoy the role – our very own Angela will likely start a Werewolf game mastering agency at some point. But sometimes you don’t have anyone wanting to do it, and then it’s a problem. And player elimination is always a problem, much more so in a game that can easily be played with 20 players. Trust me, it’s no fun sitting by after you were the first villager to be killed. With The Resistance, Don Eskridge sets out to fix those problems: no game master is required and all players stay in the game until the end. The first thing in the game, however, stays the same: people are assigned their secret identities. The majority faction in The Resistance is the resistance – raise your hands who saw that coming, please – a group of freedom fighters fighting to overthrow the oppressive, totalitarian government. No totalitarian government would be complete without their secret police. Especially not when it’s also oppressive. The minority faction is the spies who have infiltrated the resistance and are working hard to make the group blow themselves up. The spies obviously know each other from the secret police Christmas party, so they get one good look at their colleagues while the other players have their eyes closed. This is the only time information is secretly revealed like this, everything else in the game is done by proper democratic procedure. The goal of The Resistance is for the resistance to complete missions and for the spies to sabotage them. If the resistance completes three missions, they are victorious, overthrow the government and now have to deal with problems like resocialising the regime’s political prisoners after 20 years of solitary confinement – but that’s not part of the game. The spies need to successfully blow up three missions for their own victory and the victory of the glorious leader. Since there is no draw, that means we will have a winner after no more than five missions. Completing missions is a quick and easy affair, like battles in a Shakespeare play: all exit stage left, all re-enter stage with some blood-soaked bandages and talk about how the battle was won. The real work is putting together a mission team: the current leader of the resistance selects the number of people the current mission demands: two or three when playing with five players, up to five when playing with more. When the mission team is assembled the whole cell takes a vote – only if the majority of people trust the team to complete the mission can they go ahead and blow something up. If the vote of confidence fails, the hat of leadership passes on to the next player and he suggests a new mission team – the resistance is an equal opportunity democracy. If this was the real world the voting process would go on forever; in The Resistance five failed votes count as an automatic success for the spies. If you did manage assemble a team, now is the time for action: each team member contributes a “Mission Success” or “Mission Fail” card. Secretly, of course. 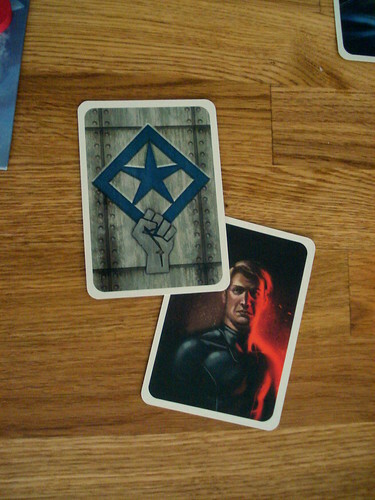 The cards are then revealed and the resistance scores a victory if, and only if, all cards are Mission Success. If there is a single failure card, the mission fails and the spies score. The Resistance plays quickly, after half an hour the empire is either overthrown or not. Whether it plays smoothly depends on your players: when every mission can only start with the fifth vote, things get tedious. The game as described leans towards the spies: they only need one fail card to sabotage a mission, and with 7 or more players there are three spies so that each of them only needs to sabotage one mission while the others stay in hiding. To counterbalance that advantage, the 4th mission requires 2 fail cards for the spies to stop it, but usually they don’t need that one. Another variant from the manual balances the game much more effectively: the regime has abolished Christmas and the spies don’t know each other: the advantage of only needing one card is still there, but the spies are much more likely to accidentally tip their hand and play multiple failures on the same mission. Actually, the game may even favour the resistance this way, but it’s much closer. If you think that only two roles sounds a bit boring in the long run, then I would agree with you. Fortunately, The Resistance included the The Plot Thickens expansion. Less fortunately, at least our game included the cards for The Plot Thickens but not the rules. Even less fortunately, the Internet is also being less than helpful on this matter. Here’s what we know: the Leader draws one, two or three plot cards, depending on the number of players, and gives them all away to one or more other players. 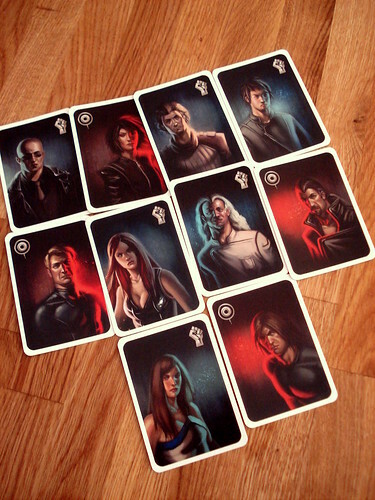 There is not so many cards in the stack, so we concluded that only the first leader for each mission does this. Cards are given to players face up, so everyone can see what cards are in play. Some cards are used once and then discarded. They allow you to look at a played mission card, usurp the leader position or nullify the vote for an already accepted mission team. This cards stay with the player who received them to use when he sees fit. Other cards have an ongoing or immediate effect: most likely these cards are intended to be resolved when they are received. So when the big boss passes you a card saying you must show your character card to another player, you do that. Despite this small but annoying omission in the manual – which is supposedly fixed in newer editions – the rules are well written and easy to follow and The Resistance comes with a very nice set of components: character cards have individual portraits, all illustrations have a sleek sci-fi look. But will you like The Resistance better than Werewolf? That’s not for me to say, really. What I can say is this: The Resistance, especially with the expansion, gives you more information to judge your fellow rebels by. By seeing who votes how, which mission fails, who receives which plot card from whom you can find out a lot about your fellow players – not everything, there is still a place for psychology and gut-feeling, but the focus on deduction is much stronger than in Werewolf. Werewolf, on the other hand, has less deduction and more negotiation and bluffing in every group I played with. If you prefer the cold logic, The Resistance is for you. If you’re looking for a Werewolf-clone without player elimination, then The Resistance is not it – for better and for worse. A final sentence for the Monty Python fans that I know are reading this: The Resistance takes on a whole new flavour when you rename the resistance to People’s Front of Judea and the spies to Romans. Just try it and enjoy.